Surgery Russian woman gets a heart valve carved from a pig's tissue. The Bakulev Scientific Center of Cardiovascular Surgery never fails to astonish with its innovations. The latest breakthrough is a unique operation performed by Russian surgeons under the direction of famous heart specialist Leo Bokeria. The 24-year-old patient, who suffers from Epstein’s anomaly (a serious heart defect that she has had from birth), received part of the heart of a pig. The replacement heart valve was handmade from the pig's’s heart tissue. The fine membranes surrounding the animal’s heart served as the basis for this bio-prosthesis which was matched anatomical features of the patient. Bokeria says he worked on this model for three years. "This valve design is physiological, because it took the mitral valve with the papillary muscles, we created an anatomical structure that is very close to nature," he said. The operation of the valve of this form is the first in the world. 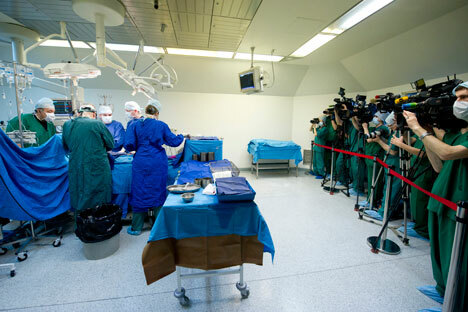 It was watched by journalists, dressed as doctors . The Bakulev Center is no stranger to such implants in heart surgery, but the ones done earlier were mainly made from pigs’ hearts. Till this day, no one has ever made a human heart valve especially for a specific patient, taking into account his or her physiological abilities. A valve that can be delivered to the heart through the femoral vein is another innovation. "This is the so-called stent-valves, which can be compressed," says Vic Kostava, head of the laboratory research on the development of bioprostheses at the Bakulev Centre. Every year, more than 10,000 patients receive bio-prostheses in Russia – a small number that is less than 30% of the people who actually require this sort of surgical intervention. The Bakulev Center alone performs over 4,500 open-heart operations a year; of these, some 40% involve the replacement of heart valves. The selection of these bio-prostheses is, however, often a problem. Every animal can’t be used in medicine. After a long search, the center settled on the farm of Alexander Konovalov. “We have specially equipped premises with good light, water, plumbing and heat. We have ventilation. In the water that we give to our animals we have even found silver ions. On top of that, our animals watch television every day and listen to classical music. Most important of all, we raise our animals exclusively on organic feed,” says a proud Konovalov. The animal tissue membranes are literally sewn into a ring 34 millimeters in diameter. The operation that Bokeria performed in May was the first of its kind in the world. Konovalov’s ecofarm, located in the Shakhavskoi district of the Moscow Region, has long been famous for its innovative methods of farming and for using ecological technologies to raise livestock. The specialists at Bakulev Center studied the biomaterials supplied by the ecofarm over a period of six months. Then they prepared several dozen prosthetic heart valves, and only after that did they signed a long-term cooperation agreement with Konovalov. “Our ecofarm has no commercial interest in its work with the Bakulev Center. We supply our biomaterials free of charge,” says Konovalov.